After the errors I made with the uniforms on my Austrian Infantry (I have updated the photos with the corrections in my previous blogpost); I thought it would be prudent to do a paint trial for my first units of Grenzers. These are the painted as the 1/13th Wallachisch-Illyriches Grenz. It is thought that by 1809 the 13th had converted to the brown uniform coat, they had light pike grey facings with grey buttons. Their trousers were sky blue. It appears that the Grenz could have either white or black leather work and straps. I also found an intriguing reference to red cloaks. and the backs. Could not resist the red cloaks, and I have noticed that the Austrian expert Archiduc Charles has gone with the same. I am quite happy with the results and look forward to painting the 36 figure regiment. I have decided to go with the 1/7th Brooder Grenz (6th Korps at Wagram) for the second Grenz unit in my Lasalle Avantgarde Core unit. I like variability in my units and it is thought that the 7th were still wearing white coatees in 1809, with pale red facings and white buttons. I plan to use Citadel ice blue for the trousers and will probably paint them with black straps to make them more distinguishable from Hungarian infantry. Well that is the plan anyway unless I hear strong objections. The dreaded close up of the paintjob! I think that test came out very well - even the "dreaded close up" is something to be proud of. 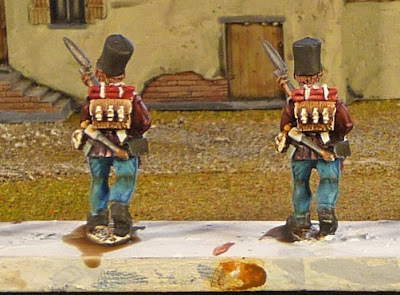 As I'm conemplating a foe for my French - who do you is more "fun" to paint - Brits or Austrians? Those look pretty good, I did not read all of the article but it appears that you dipped them? Hich tone did you use? or did you minwax them? They look fine - the red cloaks were a favourite but replaced increasingly as the wars went on with your bog-standard grey. With some Grenz were units of Serresaner (about 200 or so per regt). These were the guys who were made (in)famous with their red cloaks. They were largely drawn Balkan Muslims, used as scouts and even as military police - who said the Austrians didn't have a sense of humour. many were notorious cut-throats who 'earned' a gold Marie-Therese dollar for each set of enemy ears. No local peasant was safe and the practice and these guys were phased out by the 1805 campaign - although some were retained and absorbed into the Grenz battalions in 1809. Because of their scouting abilities they often formed the battalion sharpshooters - rifles were a prize possession. Check out Dave Hollins latest offering in Osprey that'll tell you all about them. The red cloaks on your guys could be touched up with a brick red to make them closer to the actual colour. Very nice paint job - the painter tone gives them a nice finish. 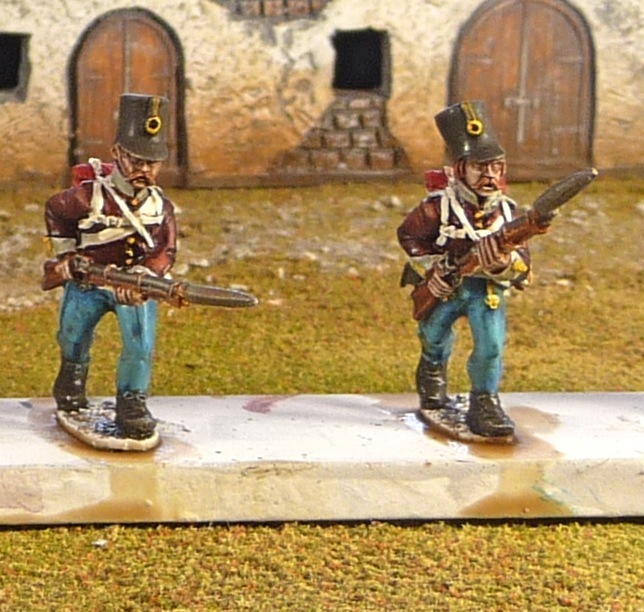 I have to say, I am enjoying painting the Austrians, much easier than the British to paint. I had a look at Hollins book, the red coated fellow on the cover looks menacing indeed. The other 27 grenz in this unit will have grey cloaks. Grenzers look great John. The unit will look very impressive once completed. Hi. I randomly found this page looking for some 13th Regiment Grenzers. Congratulations, wonderful work. I'm a direct descendant of Grenzer families from the 13th Regiment.